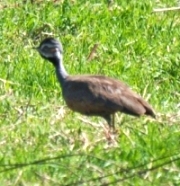 Indicator Birding - Wattled Crane in Gauteng! Early May produced a surprise new bird on my Wider Gauteng List in the form of Wattled Crane. I received a call from Dave Deighton saying that he and Clive Kaplan had found a Wattled Crane in amongst a group of Blue Cranes near Devon. 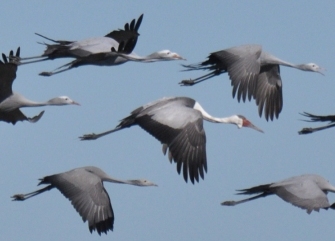 It took nearly a week before I went out with Phil Penlington on 6 May and after meeting up with Dave, Clive and Richard Montinaro were shown the Cranes, just inside the Border of Gauteng. A while later the cranes took off and moved to a new spot a few km up the road, where we were able to get better views (and a few shots). Later on we again enountered the same group of cranes, but this time in Mpumalanga - a few kilometres over the hill from where we first saw them. The Devon area is slowly emerging from the shadows as one of the most interesting grassland birding areas in the province and is covered in our book "The Chamberlain Guide to Birding Gauteng" on page describes the area which is a stronghold for specials such as Blue Crane, Orange-River Francolin, African Marsh Harrier, Pale-crowned Cisticola, Blue Korhaan and many others. 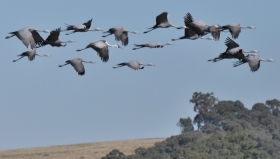 The area is described in the Chamberlain Guide to Birding Gauteng, and the the cranes were seen between point 2 and 3 on the map on page 239. On this autumn day we did not expect to see the migrants, but had an excellent days' birding nonetheless! Among the stars were several coveys of Orange-river Francolin, a single African Openbill, a group of Blue Korhaan, 3 Secretarybirds and no less than 3 sightings of Black Harriers cruising over the grasslands. 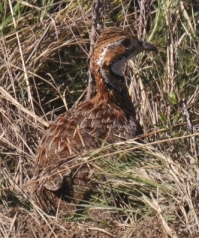 Some areas of of the grassland seemed to be teeming with Common Quail and we flushed at least 10! Beyond point 6 to the east, we also encountered large numbers of Pink-billed Larks, which are regular here. Other birds seen included Maccoa Duck, Greater Kestrel, African Marsh Harrier and Cloud Cisticola.